Humidity and Dry Skin — Monnie like Bonnie but with an M.
As we're adjusting to being down South again, we're finding that some things really surprise us. A couple of months ago we started noticing how dry our skin was. We had patches of dry skin on our face, in our noses, etc. The bags under my eyes are hereditary so I can't do much about them that I'd actually DO to them...but they were looking way bigger in the mornings. Aquaphor became my friend big time to use on my face. Someone asked if we slept with a humidifier and I said no, remembering that I'd been meaning to replace our old one with one that you didn't need to use a filter with because the filters grossed me out. I bought this humidifier and this humidity monitor. 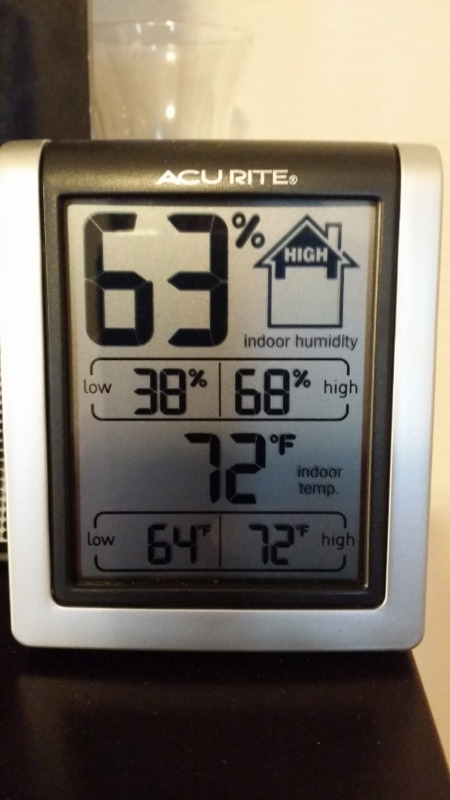 When I first set up the hygrometer it almost screamed it me because yeah...the humidity was super low. I chose the humidifier I chose for a couple of other reasons too, I needed a small one and I wanted something I didn't have to take apart in order to fill with water. You just pour the water in the top of it. I fill it with the water from the Brita pitcher and filled up it lasts for about three nights of sleeping (using the lowest setting). I generally turn it on as soon as we head to the bedroom at night. I had to play around with it to get it right because initially I was using it full blast. LOL! Seriously...I got carried away! I feel like it even helps Jaru be less itchy and I know without a shadow of doubt that my skin is much less drier than it had been in this house prior to buying it. Do you sleep with a humidifier? Do you find that it helps?